The château is surrounded by a large walled garden laid out in the 19th century in the style “à l’anglaise”, containing a large number of ancient trees as well as many beautiful flowers, a small wood, fruit trees, raspberries, currants and vines. 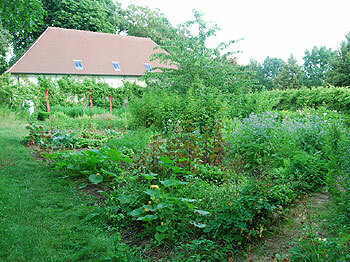 The 1 hectare of grounds also includes an organic “potager” (kitchen garden) of mixed vegetables and flowers, as well as a forest garden under development. All vegetables, fruits and plants at the château are grown using sustainable organic methods, both in the ground and in the growing frames. 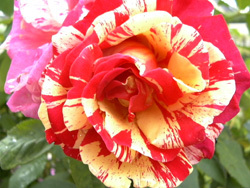 The use of organic growing techniques not only benefits the items being grown but is also far more gentle on the surrounding environment. It is the intention to be able to show to the many visitors to the château that organic methods work and to set an example in a part of France where intensively-farmed sugar beet is the main crop. Volunteer “WWOOFers” (World-Wide Opportunities on Organic Farms) come from all over the world to help with the garden. 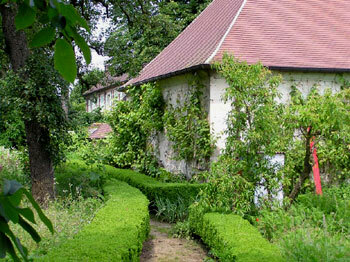 Recently re-designed, the potager is still the same one that existed over 200 years ago in one of the farms, Maison Colin, that once stood on the extended grounds of the château. 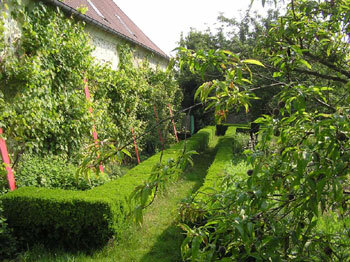 The potager consists of 4 quadrants radiating from a lovely young cherry tree and a circle of raspberry vines at the centre, the contents of each quadrant being rotated on an annual basis. One of the quadrants is always kept for potatoes, another for pumpkins, while the remaining two are used to grow a variety of vegetables, including beans, lettuce, turnip, carrot, radish, cabbage, spinach, beetroot, parsnips and leeks. Wherever possible vegetables which are known to “complement” each other, i.e. assist each other’s growth, are sown together. The vegetables are currently planted in rows radiating from the centre, the placement of tiles giving the quadrants the shape of a large kite. 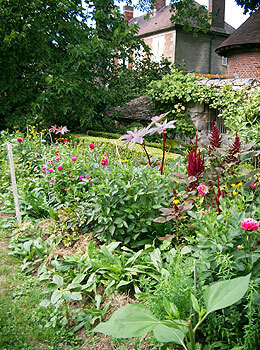 In the corners of the potager there are also strawberries and Jerusalem artichokes. There are a large number of herbs grown in the garden, all of which are used in salads, cooking or in providing delicious hot drinks. These include thyme, sage, mint, spearmint, flat-leaved parsley, coriander, marjoram, dill, basil, chives, sorrell and rosemary. There are also wild chives growing in the grounds which are said to date back to Roman times. 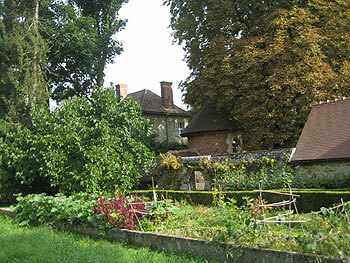 The château is particularly well-off for the number of fruit trees growing here, perhaps linked to the fact that an orchard stood in the grounds before the “parc à l’anglaise” was laid out. 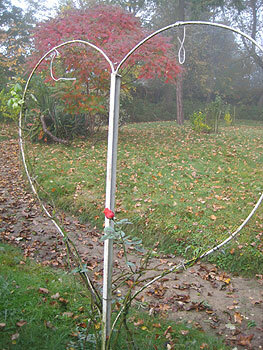 Some of the fruit trees are very old, including one apple tree and two pear trees. Other fruit trees include a very beautiful cherry tree, a wild cherry, 4 plum trees (cherry plum and greengage), and 3 red peach trees. 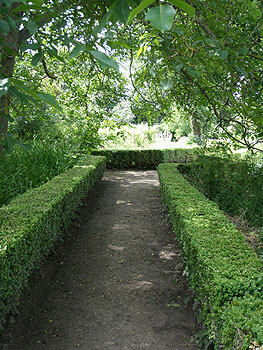 Elsewhere in the garden are grown gooseberries, blackcurrants, raspberries and redcurrants. 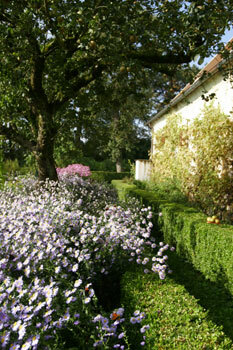 There are a number of very old trees in the grounds, including those in the “Petit Bois” (small wood). Prominent among these are the tall and elegant Austrian pines, or “pins parasols”, which form the alley of the Petit Bois. 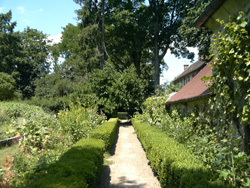 These were planted by the current owner’s great-grandfather Emile Deneufbourg in the 1890s. Through the grille in the wall at the end of the alley may be seen another of these pine trees which Emile planted in the graveyard he created. Among the other trees in the grounds are a mulberry tree, two walnut trees, and lots of hazelnut trees. A couple of maple trees have been recently planted. One at the entrance. 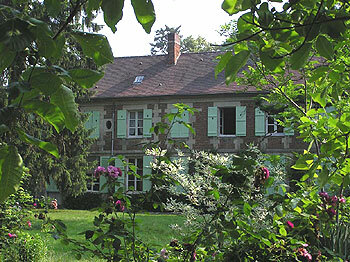 The other in the “Petit bois”. 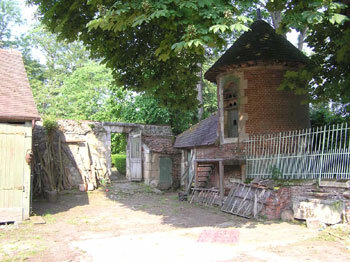 A “pigeonnier” (dovecot) provides a home in the courtyard for seven or so white doves. A wide variety of wild birds are also to be found in the trees around the grounds. The sound of bird-song is always present whether it be the cooing of the doves, the call of the wood-pigeons, or the alarm cry of a blackbird. It is always a pleasant sight to see a robin alight on the window-sill. 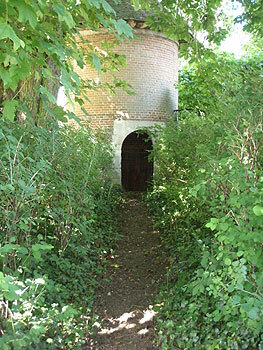 In front of the house stands an old well which the current owner can remember from when she was a little girl and used to fetch the water before meals when visiting her grandparents at the château. 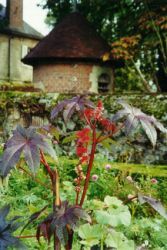 When Hermine moved into the château in 1994 the well was out of use but Australian film producer Lew Griffiths repaired the well in 2001 with a new part brought from London. 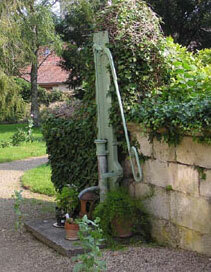 Analysis of the well’s water indicates that it contains too many nitrates to be drinkable, but the water is still put to very good use in the garden.